infostructure. : Eclipse, Android Development Problem - "Error: Error generating final archive: Debug Certificate expired"
Eclipse, Android Development Problem - "Error: Error generating final archive: Debug Certificate expired"
A really nasty problem, could have burnt through a fair bit of time. [2011-08-01 22:32:47 - SimpleList] Android Launch! [2011-08-01 22:32:47 - SimpleList] adb is running normally. [2011-08-01 22:32:50 - SimpleList] Re-installation failed due to different application signatures. [2011-08-01 22:32:50 - SimpleList] You must perform a full uninstall of the application. WARNING: This will remove the application data! [2011-08-01 22:32:50 - SimpleList] Please execute 'adb uninstall com.infostructure.simplelist' in a shell. [2011-08-01 22:32:50 - SimpleList] Launch canceled! Bugger. 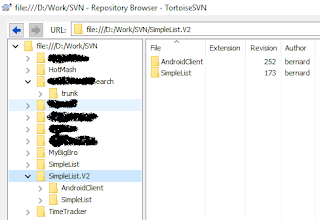 Not to worry, found the directory with the adb application in it (<...>Eclipse\android-sdk-windows\platform-tools) and run the command as specified - "adb uninstall com.infostructure.simplelist" - command runs fine. Next build works fine, and I'm back in business. This is one of the thoughtful and special post.Your blog is creating an effective Environment in Internet marketing field.